Liverpool keeping an eye on Memphis? Liverpool have reportedly identified Lyon forward Memphis Depay as a probable replacement for Sadio Mane ahead of the summer transfer window. The Reds are presently well-stocked with their options in the final third, but they are suggestions that Mane could pursue a fresh challenge elsewhere. 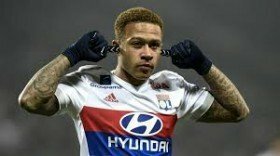 Amidst this, L'Equipe claims that the Reds are already on the look out for a replacement and Memphis has been earmarked as the prime option to bolster the attack front. Memphis has transformed his career since making the move to Lyon from United two years ago and his progress is likely to catch the eye of several clubs ahead of the summer. The Netherlands international has just over two years remaining on his deal with Les Gones, but so far, he has shown no indication of signing an extension beyond that period. Memphis has contributed seven goals and a further 12 assists from 36 matches in Ligue 1 and the Champions League this term. He has also impressed for the national side with three goals in two caps this year.